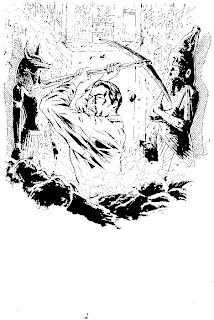 I thought I'd break down a bit more the cover art that was sent around for the piece about THE MURDER OF KING TUT project we're doing with author James Patterson. The adaptation is being written by novelist/comic writer Alexander Irvine. 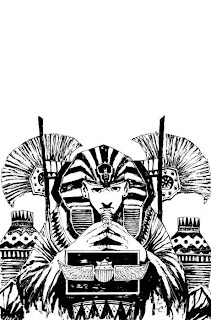 The book itself is historical non-fiction, and tells two stories: that of Tutankhamun's rise to power and early death; and the discovery of Tut's tomb by archaeologist Howard Carter in the 1920s. Since the two stories weave back and forth, we thought it'd be interesting to treat the two stories differently, with two different artists. 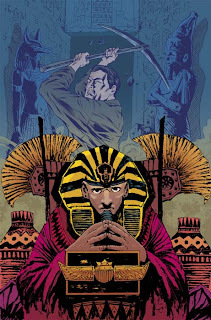 So the King Tut portion in each issue is being handled by WASTELAND artist Christopher Mitten, and the Howard Carter sequences are being drawn by Ron Randall.